Many hours days here recently have been devoted to the beginning completion of a little side project called The Dreaded Book. Even if I spent every waking hour of every day this week on the task at hand, there is still way too much to do and not nearly enough time, even though I am using vacation time from my Regular Job to focus on this. The previous conclusion was reached at approximately noon on Saturday 2:00 Sunday, May 29. At approximately 2:02 Sunday, May 29, I decided I should flee the country take a break. Later that evening, on that same break, I snapped these photos. Speaking of self-imposed breaks, and we may have been, I'll be taking a break from blogging this month week to focus on The Dreaded Book. I'm supposedly working on the book today. But all I really want to do is play outdoors. These are from Aaron's Beach. I'd much rather be sitting in sand than at a desk. But there's work to do. This fine example of doing anything and everything other than the task at hand procrastination and dawdling is now over. These pictures of honeysuckle vines were taken about two weeks ago down Williams Wharf Road, where I sometimes go to walk run a 5K wearing a crab hat jog. Honeysuckle has a very sweet scent and, of course, a very sweet taste, particularly the yellow blooms. When we were kids my sisters and I flocked to the honeysuckle vines eager to taste the sugary sweet nectar. We still don't ever get out didn't get out much back then and thus became adept at finding pleasure and amusement in the simplest of things. I still do. The tradition continues. My son and daughter also don't get out much except this weekend when they'll be in New York City while their mother stays behind working night and day to meet her book deadline appreciate the fine art of sampling honeysuckle. For the uninitiated, the process of extracting the nectar is easy but not exactly obvious if you've never done it. First, you must select a flower. If I were choosing from the vines above, I'd go straight for the yellow flowers because they're older and sweeter. Just like me! Sometimes I r-e-a-l-l-y crack myself up. Once you've picked the flower from the vine, pinch off the end, put it to your lips, and savor that ever-so-tiny drop of nectar. In a quick Google search on the topic, I discovered that honeysuckle has many healing properties and contains tannins that are being studied as a possible treatment for HIV. Also, certain species produce toxic berries, while others have poisonous leaves. However, some people boil the leaves for medicinal purposes. So, to be clear on CBW's official stance on honeysuckle leaves? They either kill you or heal you, there appears to be no middle ground on the issue. Be sure your health insurance cards are handy and consult your doctor before you heed any home remedy advice from this blog start harvesting honeysuckle leaves for a salad. "Honeysuckle is also known as woodbine. It twists and coils as the ivy does. Beautiful yellow flowers entwine with the leaves. Its scent is very cloying and sweet. The honeysuckle shows the way in which to achieve the search for the self. Honeysuckle indicates hidden desires, secrets and the path to the search for the self." The other day at Aaron's Beach I spied this basket. It was hanging out in the sand enjoying the weather almost as much as I was. Most people think of crabs, rightfully so, when they see these. Although there's little reason to doubt this basket was once used for hauling crabs, my first thought whenever I see these is of daffodils. When my grandfather grew daffodils commercially, the packing and shipping operation was run out of his barn. The pickers bunched the flowers with rubberbands and gathered them in these baskets. I'd drive a tractor towing a wagon up and down the fields, load the baskets, and deliver them to the barn. They were then submerged in metal buckets of water where they waited their turn to be packed into long cardboard boxes which were then shipped to places unknown, otherwise referred to as "Up Nawth." "G.H. Vogel had a plan that he hoped would be a golden opportunity for the daffodil business. From 1963 to 1968 the retired Army brigadier general spearheaded a study to determine the feasibility of manufacturing perfume from daffodils grown on the Middle Peninsula....In 1963...a local resident who owned a perfume company called May Cove expressed a desire to develop a fragrance representative of Mathews County. ** Vogel and other daffodil growers gathered 190,000 blooms to be tested at Virginia Tech to determine if commercial extraction of natural oils for the perfume were economically viable and if a market could be established for the product. Only five pounds of pure daffodil oil had been produced in the world in 1962, Vogel said at the time, and none was manufactured in this country." Chemists were successful in obtaining the essential oil, which my grandfather then took to New York for further testing. Although they determined that commercial quantities of the oil could indeed enhance flavors or fragrances of other items, the money they would earn from the essence could not offset the cost necessary to gather the blooms and extract the oil. The article goes on to say, "Vogel, who used to grow as many as 13 acres of daffodils, has reduced his crop to about five acres. At age 84 he has decided to let another grower harvest his flowers this year." It's amazing the memories conjured up by an otherwise ordinary basket washed up on a beach. **By the way, a fragrance representative of Mathews County would have to include eau de creek mud, dead crabs and snapping turtle stank salty sea air. Depending on the season, there might also be some honeysuckle and freshly cut grass tossed in for good measure. We'll forgo the opinion of the Virginia Tech chemists and assume there's not much profit in such a scent, even if some people, myself excluded included, consider it priceless. What a spectacular weekend this was. The weather was perfect. Clear, warm, not too hot, and breezy enough to keep the bugs at bay. Most of my time was spent chasing Canada geese out of the back yard. The End. Friday evening I went to Deltaville for the first time since the tornado. Even after all these weeks, the scene at Zoar church is a very vivid reminder of that storm's unbelievable strength. Saturday was spent at the library doing research for the book. Later that evening, I ran a 5K wearing a crab hat. Sunday, in addition to a very relaxing visit to Aaron's Beach where these shots were taken, I dragged a stinking snapping turtle out the middle of the road. Just in case you were wondering, snapping turtles are very strong and very stubborn. They do not like to be tampered with even (and perhaps especially) if you're trying to save them from becoming the next Turkey Buzzard Delight Early Bird Special at the Road Kill Cafe. Plus, it is worth reiterating that they stink. This one evidently had been hibernating in swamp mud for decades months, making it even more stinky, more slippery and therefore nigh on impossible to drag out of the road. Also, it stunk. Stank. Stunk. Stinks. Still. I swear I can still smell that rank turtle stank on my hands. As I'm standing in the middle of the road wrestling a very unsanitary unhappy snapping turtle--as if I have nothing better to do--a lady pulls up, rolls down her window, and asks, "Are you trying to get him out of the road?" To myself I answered, "Just out of curiosity, what else would I be doing, standing here in the middle of the road with this nasty, stinking turtle that would like nothing better than to snack on a few of my fingers? " Eventually I moved him to the shoulder and we all went our merry ways. So, anyway, aside from chasing Canada geese; running a race wearing a crab hat; and going a few rounds with a stinkin' old snappin' turtle, it was just an ordinary weekend around these parts. p.s. This blog has reached a new low when the focus is on dragging a snapping turtle out of the road will be slowing down over the next few weeks as I gear up for intense work on the book. This week's posts will be sporadic, and next week I'm taking a break from everything in order to focus on meeting my June deadline. Once again I'm sharing some unedited shots of the skies over Queens Creek. I'd say these were shots of the sky over Queens Creek but with all the multiple personalities and ever changing moods displayed, skies seems like a more appropriate word. All of these were taken over the past week. These last several were from early in the morning, as I was getting ready to leave for the hour-long journey to work. Thankfully I don't have to worry about that drive again until Monday morning. And for that one small reason alone (rest assured there are plenty more where that came from), I absolutely adore weekends. Would love to hear what you're up to. I'll be working on the book and *possibly* running a 5K Saturday night at Williams Wharf. Welcome to the day of the week known as Three Thing Thursday, where we share three things or three thoughts or three ideas or three suggestions or someone please take the needle off this record, it's skippin' somethin' awful. 1. The photo above was taken from my back yard Tuesday evening. Just as yet another incredible dinner prepared by my mother was wrapping up, we realized there was a Coast Guard boat headed in our general direction. Although they come up the creek periodically from Milford Haven, the Coast Guard never comes into Miller's Cove. They went about as far as they felt comfortable particularly considering some crazy woman was pointing a camera at them then left as quickly as they came. Guess they were just out sightseeing. 2. 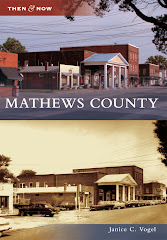 The Mathews County book I'm working on is due to the publisher by June 21. Now, June 21 sounds like a long ways off and has for some time. It really sounds like a long ways off when you think it's still March (except it's May) and you can't remember if Easter has come or gone yet (it's long gone, honey, get with the program), and the situation is made more confusing by all the Easter baskets and chocolate bunnies still strewn about the house, creating visual reminders that Easter is either imminent or just barely gone (when, in fact, it's long gone). May 21 is this Saturday, no matter what I think. This means the book is due day after tomorrow in one month. 3. One month in CBW Time does not equate to 30 or 31 or even 28 days. One month for me equals negative three days one and a half days when you subtract out all the time spent commuting, working, working, commuting, attending children's school events, working, driving, going somewhere, doing something, having no spare time and of course dillydallying, dawdling maintaining a home and a yard. In short, I have lots of Easter decorations to put away work to do, especially on the book, and only a few days in which to do it. Right on the heels of yesterday's declaration that I had no new batches of photos, here we have some shots of Queens Creek which I forgot were taken Sunday evening from my back yard. See, I'd worked the entire weekend. Finally, after cutting the grass Sunday evening, I decided all work must cease and desist. Relaxation was about to begin. So I dragged a lawn chair down by the creek and started snapping photos. along with this bush, which still shows signs of being scorched by one of my father's good deeds: a shoreline burn. One evening after a particularly grueling day at the paying job, I walked into the house, glanced out the back window and noticed the better part of the yard down around the bank of the creek had been singed a nice shade of burnt right up smoky black. In a situation where ordinary folks might have panicked (a situation which very clearly screamed not long ago your back yard was ablaze), I merely responded, "Awesome. The house is still standing, no trees caught fire, and there's less brush to cut back. Where are the potato chips? I'm starved." You see, around these parts, we some folks intentionally burn their shorelines to keep the growth down-- and to encourage the wild asparagus. To repeat: we intentionally light fires both to tame growth and encourage new growth. p.s. We ate some of that asparagus last night for dinner. Mmmm, mmmm good. Here are some more photos from about a week ago at Aaron's Beach. There's been no spare time for any photo misadventures excursions here lately, so there are no new batches of pictures. However, most of the time I only show a small sampling from any given batch anyway, so thankfully there are plenty in stock to share. "Batch" is a technical term I learned in that English composition photography class I never took. ...even if the scenery appears to be tired of me and is focused on things like preening or sleeping or yoga or whatever the heck these birds are doing. Since I'm stretched so thin that I can't find anything new to talk about other than birds doing yoga or whatever, tell me what's new and exciting in your world. If there's nothing new and exciting, then tell me what you're looking forward to most today. I'll be looking forward to this evening, for no particular reason other than it will mean the work day is behind me. Hopefully so will this last image of birds doing yoga or who knows what. Although all most of my weekend was spent working, I broke away for a few diversions, one of which was a surprise 70th birthday party for a neighbor, Miss Phyllis. A patchwork quilt of characters was in attendance. There were many Come Heres, a couple of whom arrived by boat. There were several From Heres, including the mother of a high school friend. And last but not least there were a few neighbors. Neighbors who are from here. The Come Heres struck up charming conversations with anyone who made eye contact. They spoke about things like home renovations and an overabundance of tart cherries, which make excellent pies, in case anyone should want to stop by and please help themselves to some. The From Heres carved off their own niche and talked about things like the tornado, and how lucky we were to have been spared. We talked about gardening and tomatoes and which types of peppers we'd recently planted. My friend's mother and I talked at length about the book I'm working on. She enjoyed pondering my questions about what Main Street looked like decades ago, and I enjoyed listening to her reminisce. It was nice talking with the neighbors too. In case I haven't mentioned it before, we're a very eclectic, eccentric, quirky crazy fun-loving bunch around here. Below is an excerpt from a conversation which perhaps illustrates this. Chesapeake Bay Woman to Neighbor Lady She Has Known Her Entire Life: "Hey there, your hair is pretty, it's getting so long." Neighbor Lady: "Yeeeah. I've cut it off three times now for Locks of Love. I only cut my bangs now and let the rest grow out." Neighbor Lady, as serious as a heart attack: "Oh yeah, it's long enough that I can use it for dental floss again." Neighbor Lady, with a nervous laugh: "Y'all do that, don't you?" CBW, who recognizes her inability to focus can be a strength: "How about that tornado? Do you have any tomatoes in the ground yet?" Every week day when the alarm goes off at 5:30, my first thoughts are usually very negative. Stuff like, "Oh noooo! Not another workday. No, not again." Or, "Please. How is it time to get up when I just lay down to go to sleep?" Or, "[Insert an unsavory word or two of your choice here]! Why can't I just go back to sleep? This is cruel and unusual punishment." So to reverse all that negative thinking I say, "Thanks for another day," or "I'm grateful for another day, a roof over my head, the paying job, and healthy children who are able to go to school," even if that initial unsavory string of words is what I'm still actually feeling. The thing is, if I ever did ignore my responsibilities and sleep in, I'd miss some of these scenes right outside my back door. Each sunrise is different but all of them are spectacular. The sky changes very quickly so you have to be looking in just the right place at just the right time to capture the best each morning. I hope you capture the best of this day and the best of the weekend. Have a good one. Here we are once again at the day of the week called Thursday, which is when we are encouraged to share three random thoughts or observations. 2. These next four to six weeks are going to be brutal. In a couple weeks, I'll have to take vacation time from the paying job just to work on the non-paying job book. Blog postings will be worse and worse sparser and sparser the closer I get to June. 3. There's nothing better than my mother's cooking. Twice this week we've had the privilege of eating salad made with vegetables and herbs from her garden, and I don't know when I've had anything better. Her homemade pizza is to die for. Pretty much anything and everything she fixes is divine. The cooking gene seems to have skipped a generation with me. The conclusion I draw from all this is the Chesapeake Bay Children and I need to spend more time over there eating good food and less time over here eating stuff that looks about as appealing as a science experiment struggling against what Nature intended. And Nature most definitely did not intend for me to be in a kitchen. Now it's your turn to share three things. Whatever you want. Ah, here we have a peaceful glimpse of the Canada geese taking a quiet, leisurely swim along the shores of Queens Creek before retiring for the evening. They're unhurried and relaxed, slowly absorbing the sights and relishing what's left of the day. Below is the heron, who isn't exactly relaxing or savoring the remains of the day. His laser-beam focus is on a very serious mission that does not entail lollygagging or admiring this or that or winding down for the night. He's in search of food--food he will not slowly savor but swallow whole before resuming his search for more. Next up, we have this particular royal pain in the... nuisance specimen of foul fowl, which is unable to relax at all and takes great pleasure in ensuring nobody else around is able to relax either. Here he displays his superior (?) intelligence. Here he shows his impeccable attention to oral hygiene. He's tired of pretending any longer. His true self festers beneath the facade. Like a volcano--a volcano full of hot, molten lava molting evil--he prepares to erupt. Finally, he can contain himself no longer. Click here and here for the sounds that came from Gustav after this hideous hiss. Click here and here and even here for what slipped from my mouth.